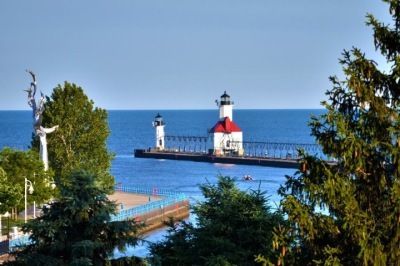 Saint Joseph, Michigan has long been a hidden gem on the shores of Lake Michigan. We are just blocks from beaches, shopping, dining, wine tasting, art museums and galleries, and entertainment. 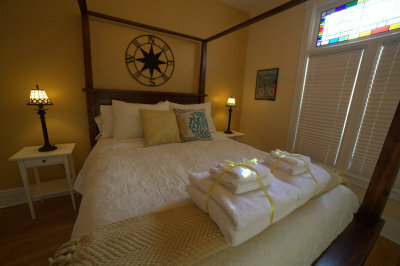 Inspired by the rich history of Michigan and Saint Joseph, this room features a private bath with a jetted tub and a stunning four post canopy bed. Return to a quieter, slower paced time and wake up to rainbows of light coming through the stained glass window. 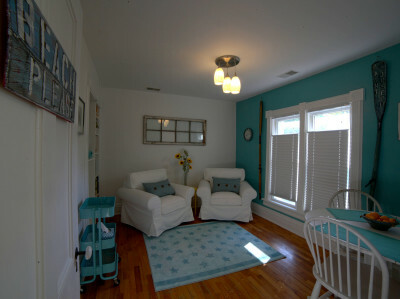 You will feel like you are living at the beach in this room, complete with your own private sitting/breakfast room and a 1920's inspired bath with a large walk in shower. 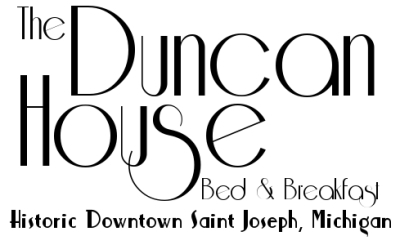 Nestled in the heart of historic downtown Saint Joseph, Michigan, The Duncan House Bed and Breakfast is the only B&B on State Street, and the closest to town. State Street has long been recognized as one of the grand old streets in Southwest Michigan., and as you stroll along this tree lined gem you will understand why. Rich in history, this area features a variety of Victorian Era architectural styles. Many of these old homes feature large porches, and The Duncan House is no exception. As a guest you can relax on the porch, enjoying a morning cup of coffee listening to the birds, or an evening glass of wine with the sunset. You will be treated to daily snacks, a complimentary glass of wine, and of course a gourmet breakfast every day. Our concierge service can help you arrange a massage, dinner reservations, a fishing charter, and more, just ask. Come, relax, and unwind in the victorian grandeur of Saint Joseph. Andy is a trained spotter for the National Weather Service. We maintain a weather station that supplies data to NOAA, WeatherUnderground, and The Weather Channel, check out the feed below. Visit the official St. Joseph Lighthouse site to learn about the hisory of the lighthouse and view a live webcam feed.